Purple Basil? Let’s Make An Amazing Pesto! | Pasta & Co. Ever heard of purple basil? I hadn’t until my amazing farmer brought me some just yesterday. It makes a wonderful pesto to dress your favorite pasta, and a different spread for your cheese plate. While I was blending it, I thought it would turn out dark and rather unappetizing in color – I had to close my eyes for a bit to taste it to reset the senses. Folks, it actually is one of the best pesto I ever had! Nutty, rich and almost spicy. Looking forward to make a colorful caprese, infuse vinegar and why not maybe a sorbet? Full a pot with 2/3 of lightly salted water and bring it to boil. Add pasta to boiling water and cook “al dente”. Gently wash the basil, pulling all the stems off and preserving only the leaves. Allow them to dry on a towel, or pat them gently with towel paper. Put the pine nuts, garlic, cheese and half of the oil in the chopper and work them at full speed ’til you get a creamy mixture. Add the basil leaves and work at full speed until you see that the leaves are completely crushed and incorporated. 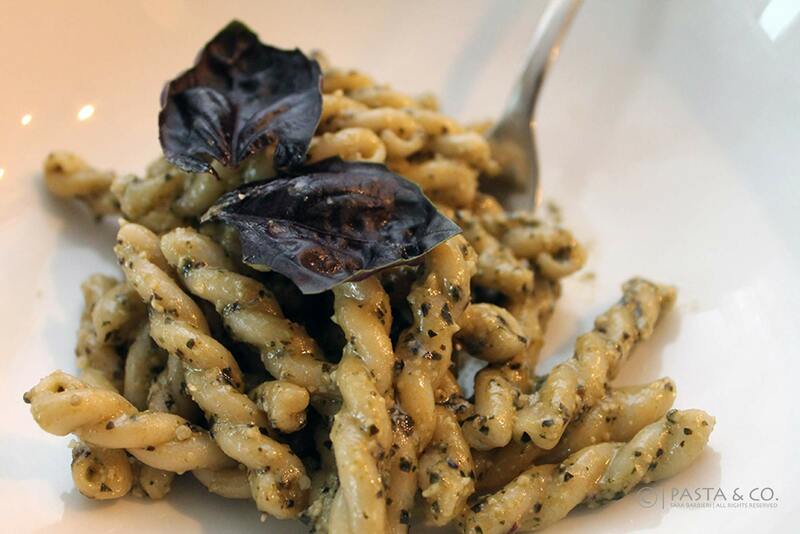 Take a bowl, pour some pesto in and stir in a few tablespoon of boiling water. Drain pasta with an Asian strainer, pour it in the bowl and mix it so to cover the pasta evenly. Plate it up, decor with some basil leaves and enjoy!